Here is my 5 year old son in his Halloween costume from this year. 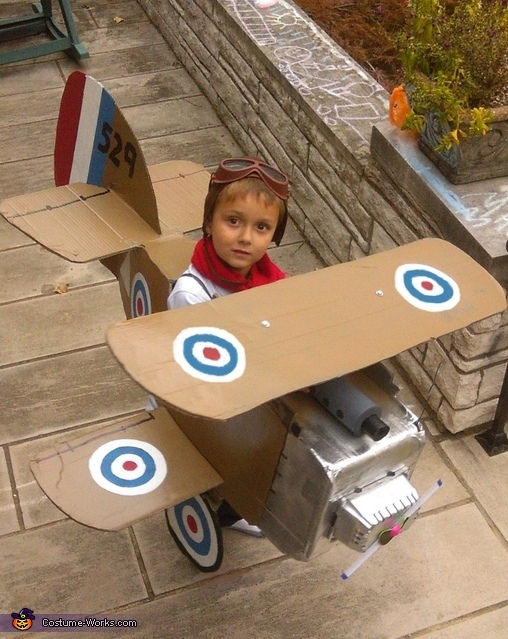 He was going as a First World War British flying ace in his mini historical copy of the famous Sopwith Camel, the most successful bi-plane of WWI. My dad put most of the plane together with lots of cardboard and paper tape, then spray painted it and hand-painted the details on following real plane images. Next, my husband bolted on the top bi-plane wing then we engineered a small personal fan to become a real working propeller in the front. There's even a version of an "air-cooled machine gun" in the front, made with foam pipe insulating tubing! I self drafted the faux leather scull cap for my son's head and we spray painted some toy work goggles to match. The plane goes on over his head, and stays up on him with inner suspenders. In my mind, the idea for this costume stemmed from Steve Trevor, the British flier from this years' Wonder Woman movie, but unfortunately, with the red scarf, he kept calling himself the Red Baron (German flying ace)!